You can delegate this responsibility to your agent or representative, but it still remains your legal responsibility and it will be you who faces fines of up to £3000 if the checks are not carried out! 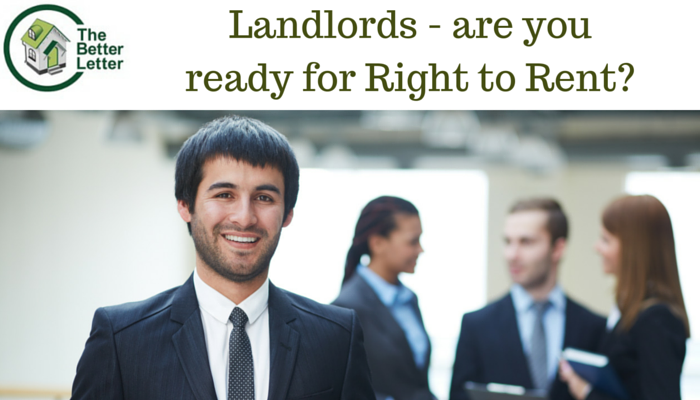 But what does ‘Right to Rent’ mean, and how do you ensure that your tenants comply? The new Right to Rent checks are part of the Government's Immigration Bill and have been introduced to ensure that private landlords do not rent properties to illegal immigrants. If a person has a right to be in the UK, then they also have a ‘Right to Rent’ here on the same basis as any legal citizen. If someone is illegally resident in the UK, then they do not have a ‘Right to Rent’. There has already been a ‘Right to Rent’ pilot scheme in Birmingham and parts of the West Midlands since 1st December 2014, so if you have a property in that area and you have had a new tenant since the pilot started, you should have already made those checks. Check that the documents are genuine, with the tenant present. Make and keep copies of the documents, and record the date you made the check. Checks must be carried out on all new tenants, not just those you suspect of being from outside the UK. We recommend making the ‘Right to Rent’ check part of your inventory check, so that it can be properly witnessed and recorded. If an agent or inventory clerk carries out the checks for you, make sure they provide a record of the check and the documentation. So comply with the new Right to Rent legislation and be a Better Letter! Should Letting Agents fear or embrace the rise of the review sites? There has been a rise recently in review websites where landlords and tenants can rate their letting agent – both large generic sites like TrustPilot (where companies pay to make their brand available for review) and specialist letting agent review sites such as AllAgents and raterAgent. Many letting agents are wary of the ratings sites, pointing out the prevalence of poor reviews and the anonymity of those leaving them. They complain that there is little opportunity to respond if a review is left maliciously, or if a tenant gives their side of the story, leaving out a few key facts (like the damage they did to the carpets, or the pets they kept in contradiction of their tenancy agreement!). But review sites are here to stay; consumers are used to a post-Trip Advisor world and expect to be able to go online and find independent reviews of anything and everything faster than you can say Google! 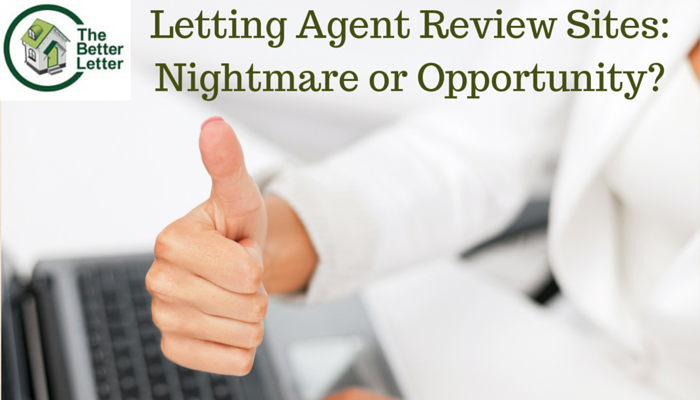 So how should letting agents respond to the rise of the review sites? Although there are some smaller sites that just allow disgruntled tenants to rant anonymously with no means of response, the more established sites allow lettings agents to engage with consumers, making the review process more of a two way street. AllAgents allows agents to set up a profile page so that reviews are correctly attributed to them and they can receive notifications of any reviews (good or bad! ), enabling swift engagement. They have a nice clear ratings system and highlight positive reviews. raterAgent also has a free service for agents to manage their profiles and respond to reviews. They claim to have a stringent process – both automated and then checked by humans – to weed out fake reviews – either malicious reviews or good reviews that come from the agents own staff or friends. There is a tendency for people only to go to review sites when they want to let off steam, which leads to a preponderance of awful reviews on these sites (while some good Letters - hem hem - never get mentioned at all!). So follow the practice that hospitality businesses have adopted in the past few years in response to TripAdvisor – direct your clients (tenants and landlords) clearly to review sites, and encourage them to share their honest reviews. Although, of course, malicious or biased reviews are a worry, the review sites are a reality now and can’t be avoided. What you can avoid is accruing bad reviews through shoddy service. Many bad reviews seem to centre around poor communication, properties that were not as represented (ie, described as ‘professionally cleaned’ when they were anything but! ), and neglected repairs. So keep abreast of current legislation and requirements, deliver the service that you promise and work only with landlords that support you in offering a Better Letting experience to tenants. Hopefully the review sites will encourage everyone to be Better Letters! 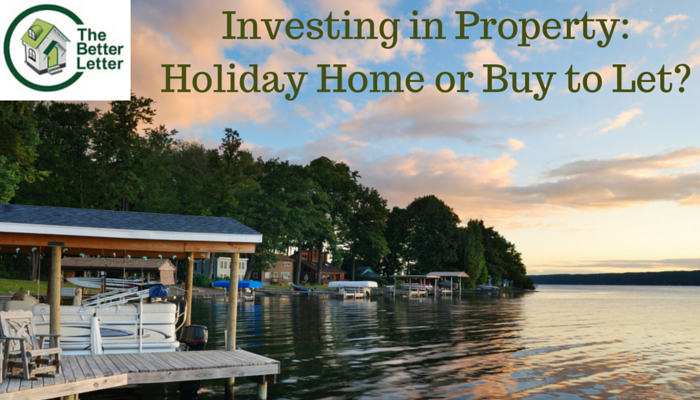 Are holiday homes a good alternative to Buy to Let? With the proposed changes to the way that Buy to Let income is taxed due to take effect from April 2017, some landlords are rethinking the type of property that they invest in. Holiday homes are - for the moment – unaffected by the forthcoming tax changes, and with their high gross yields they can look like an attractive investment opportunity, even where we are based, in Oxford. When people think of holiday lets, they often think of the seaside, but Oxford has regular conferences and events, visiting academics (and their families), a booming business sector that needs to house international guests and – of course – the surrounding Cotswolds and associated tourist attractions. So what are the main things to consider when you’re trying to decide between a Buy to Let or a Holiday home? Most mortgage lenders will only lend on a holiday property if the mortgage is assessed against your current income (not your projected income from the holiday let). Many mortgage lenders will refuse to lend on holiday properties at all. However, if you are prepared to do your research, there are a few smaller building societies who are capitalising on this gap in the market by offering specialist Holiday Home mortgages and competition in this sector is hotting up so there are better deals to be made than a couple of years ago. One of the advantages of a Buy to Let investment is that, once you have good tenants in, there is not a lot of work for you to do other than keep on top of maintenance and make sure inspections are carried out semi-regularly. In contrast, a Holiday Let needs regular attention, re-letting, cleaning and maintenance. And if you are planning on spending holidays there yourself, then be aware that this will probably cut into the most popular periods for letting. As well as being exempt from the changes coming in 2017, furnished holiday lets qualify for Entrepreneur’s Relief, reducing your exposure to Capital Gains Tax. And if you are actively involved in the day-to-day running of the let – cleaning, maintaining, possibly providing breakfasts – then you may be eligible for Business Property Inheritance Tax Relief after death. So consider what kind of landlord you are before deciding if this investment is the right one for you. If you are thinking of a property close to home and are enthusiastic about running this as a proper business, then Holiday lets could be for you. But they are not for the fainthearted! It's all gloom and doom - until you check the small print! There may not seem to be any good news for independent private Landlords in George Osborne’s announcement that from April 2016, there will be an additional 3% Stamp Duty levied on all Buy to Let purchases over £40,000. But hidden in the small print is a bit of good news for those landlords (or those interested in Buy to Let investment) who are interested in capital growth more than an income from rent (read more about the differences here). 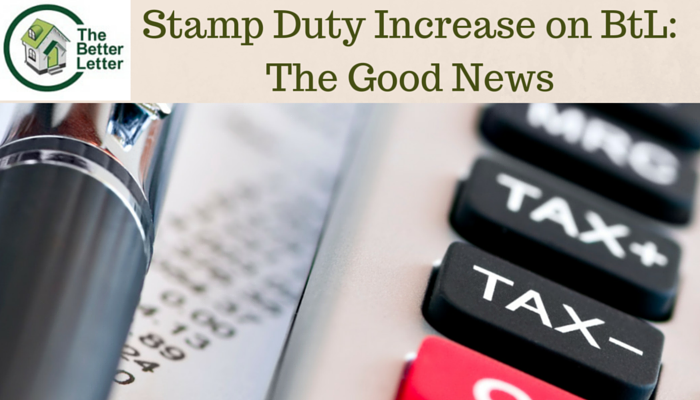 Under existing legislation, property investors can offset their purchase costs against any eventual Capital Gains Tax – and that will include the cost of Stamp Duty at the new rate. The 3% increase will apply to any purchases over £40,000. BUT, contrary to early reports, properties over £40,000 will have Stamp Duty levied on the FULL AMOUNT (not only the amount above the initial £40,000). Limited companies which own 15 or more properties will be exempt (subject to consultation – so watch this space). It is not yet clear if the increased Stamp Duty will apply if you buy in the name of your child, or your partner (unmarried couples only), so consult your accountant and your solicitor to make sure you stay on the right side of the law. With predictions that the market will hot up ahead of April, mortgage companies are already offering better fixed rate deals to take advantage of the rush. So if you do intend to become a Better Letter, now could be the best time! And if you’re thinking of investing in property, but unsure what type of property is best for you, read our article on Building a Property Portfolio: 5 Things Letting Agents Know That You Don’t. 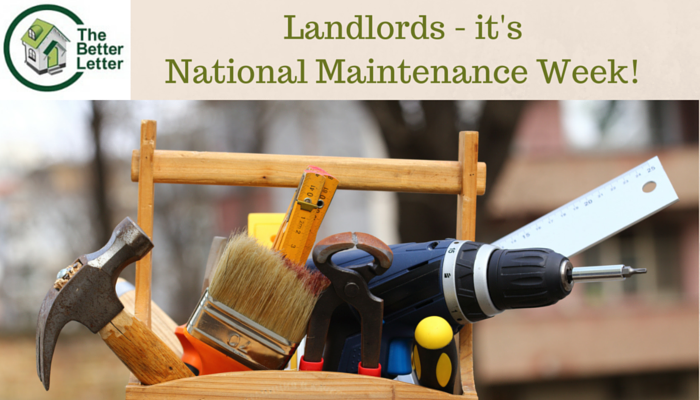 Landlords – it’s National Maintenance Week! Starting tomorrow (20th November), it’s National Maintenance Week! With a wet and woolly winter ahead, it’s a great time to think about checking your properties for any maintenance issues. Better Letters know that a small maintenance issue dealt with promptly can avert costly repairs further down the line. So what are the main steps you can take to make sure your buildings are well-maintained and your tenants happy? November 27th rounds off National Maintenance Week with National Gutters Day. It’s an excellent idea to have one day a year when you check your gutters, as a blocked or leaky gutter can quickly lead to expensive water damage to your walls if it’s not dealt with. Regularly clearing and checking your gutters is a cheap and easy fix to what can otherwise be a costly problem. And luckily for us all, there’s plenty of rain forecast, which makes it easy to see which – if any – gutters are leaky or external drains are blocked! Tenants often don’t report smaller maintenance issues to their landlord, as they don’t want to be a ‘nuisance’. They might not realise that a small problem dealt with now can avoid a large and expensive problem later. If you have an experienced letting agent who will conduct regular inspections, spot potential problems and deal with them promptly, so much the better. If not, think about visiting your tenants every six months to talk to them over a cup of tea and let them know you’d rather hear about a problem sooner, than later! As well as any damp, leaks or holes, it’s worth keeping an eye open for wasp nests or signs of rodent life! Pests can thrive in a neglected attic space for some time, before making their presence known in the main house. Dripping taps, faulty locks, radiators that don’t heat all the way up, damaged locks, any little mould patches. Keeping on top of all these little jobs will prevent larger jobs cropping up and encourage your tenants to treat the property well. The National Landlords Association have an extensive maintenance calendar for landlords who want to keep on top of their properties all year round. But start with the basic checks above and you’ll soon be a Better Letter.